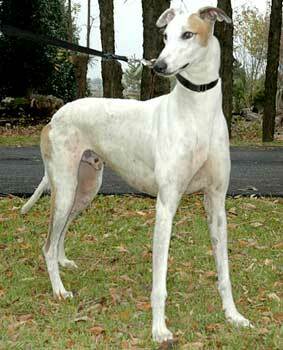 Achilles, formerly Kyle, aka Kyle's Comet, is a 10-year-old white-and-red male, born August 15, 2000. Achilles's sire is Ace A Matic and his dam is Racey Jan. Achilles, exactly like Bayou, started his racing career on June 12, 2002 at Jacksonville, Florida and finished at Valley Race Park in Harlingen on April 6, 2003. Protatek tick panel test resulted in his being positive to Ehrlichia at a high titer and also positive to Babesia. He has gone through treatment of almost 4 months and his retesting shows a very significant drop in his titers! 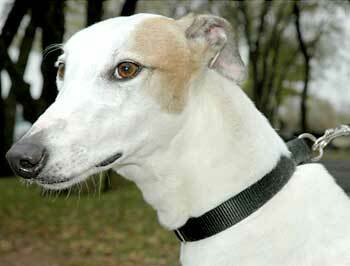 Achilles was in a home for several years, but has since returned through no fault of his own. He is cat tolerant.